Allows you to keep resolvers on machine, especially where they are very small, or integrated into the motor. Produces differential A, B and Z outputs just like an encoder. Has fault detection logic that can open the E-stop chain upon a failure, broken cable, or power loss. The Resolver Converter interfaces to magnetic resolvers used on some machine tools for position feedback, and produces the same signals produced by common quadrature encoders. It fits on a 3 x 3.5" PC board and requires only 5 V at 250 mA for power. Jumpers are provided to vary the excitation of the resolver to meet the requirement of the AD resolver converter chip, which requires an input level of 3.6 V p-p. Due to the way resolvers are built, there is some loss of signal amplitude, so you will have to determine the correct jumpers that give the required drive level. 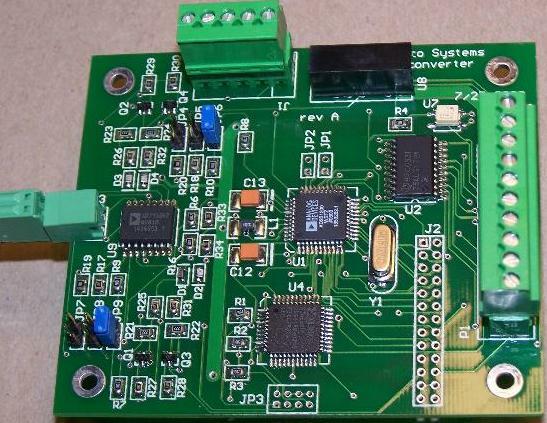 Pico Systems is currently delivering this board at an end-user cost of US $150. Note the holes clear a 4-40 screw.